FAQ for NRIs: After being an NRI, what are the major setbacks you are still facing after returning to Bengaluru? My wife, son and I have US citizenship (and Indian OCI) and we moved back to Bengaluru about two years ago. My dad, who had been diagnosed with prostate cancer a while ago was starting to gradually slow down. 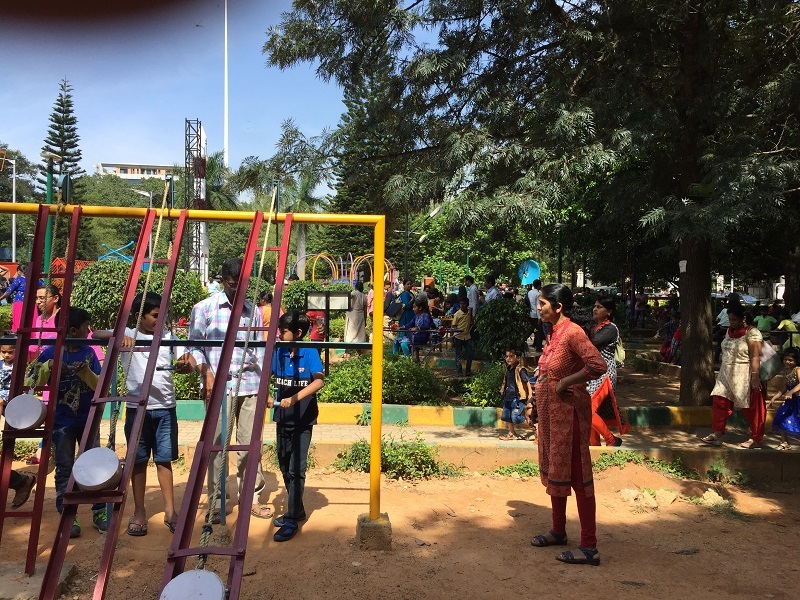 My aging parents lived alone in Bangalore, and I got the dreaded phone call from my mother on the verge of breakdown herself, asking for help. I’ll club the usual suspects - Traffic, pollution and general chaos of the life - in one bucket. This is something I had to work through and accept as a way of life here. Organic growth of the city - I had grown up and worked in the Bengaluru where people still rode bicycles for short distance commutes. Now Cars, bikes and scooters are much more ubiquitous. After living in the west where zoning laws and regulations are generally respected, it takes a while to accept that such organic, unplanned growth is the way of life. 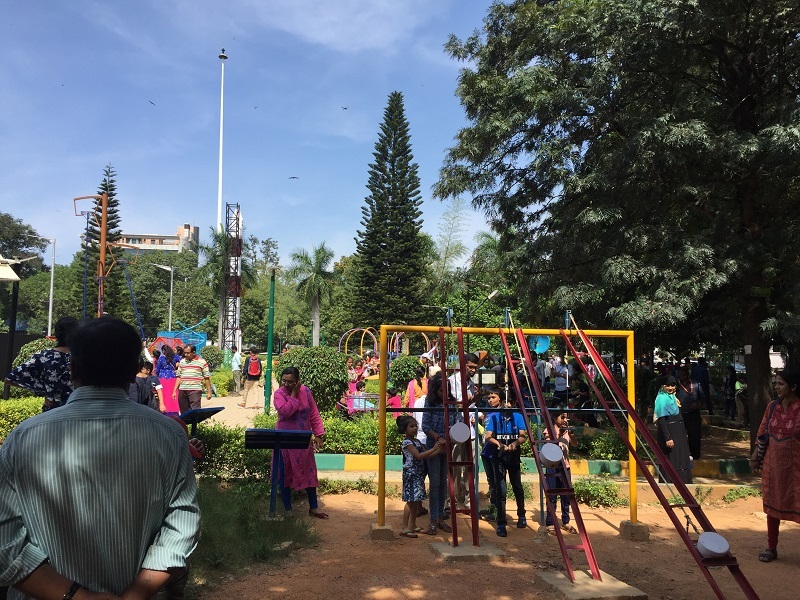 Bangalore was known as a Garden city, but there are hardly any private gardens (ref my post - Return to India Musings: when a home becomes a golden egg). Houses that had some patch of greenery or even a few coconut trees are giving way to concrete structures and flats. I haven’t yet reached the point where the regrets outweigh the decision to move back. If you are looking for an ideal way to spend with family, kids and others interested in Astronomy? 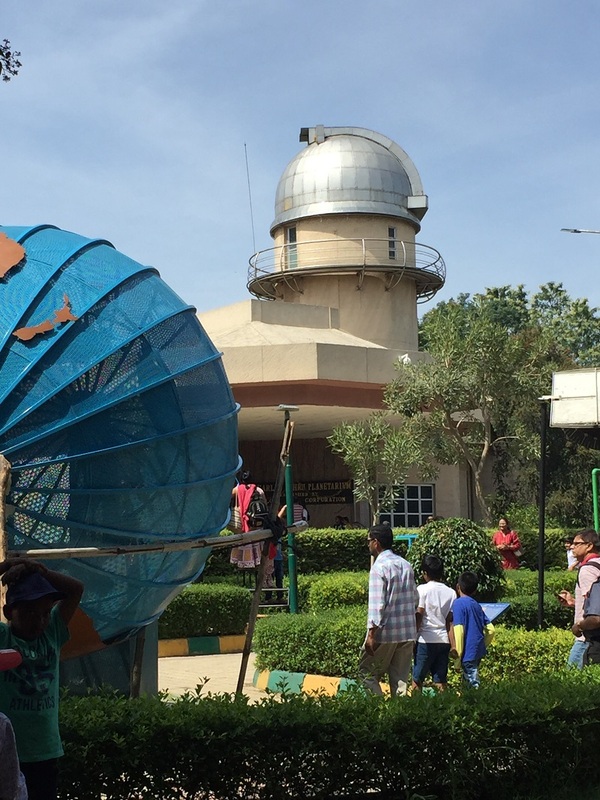 Check out Jawahar Lal Nehru Planetarium. 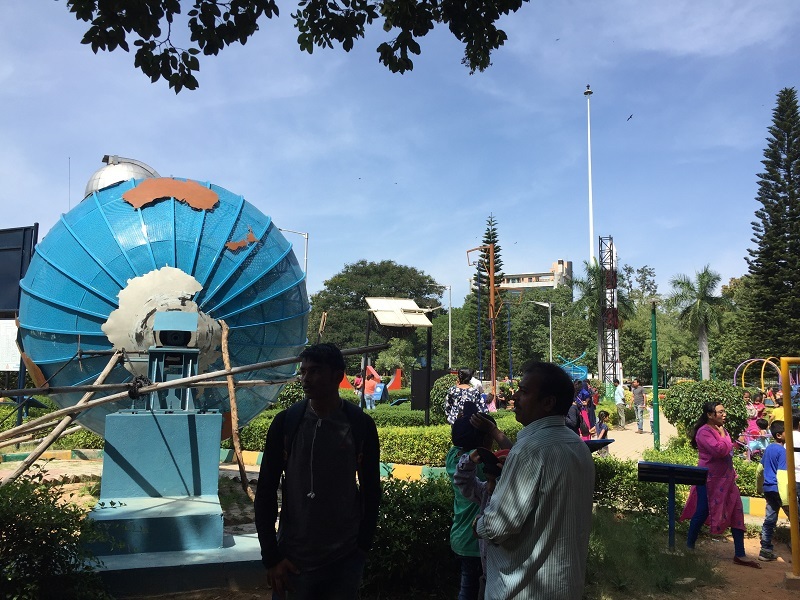 Located at the heart of the city, Jawaharlal Nehru Planetarium (JNP) is administered by the Bangalore Association for Science Education (BASE). BASE is devoted to science popularisation and non formal science education. 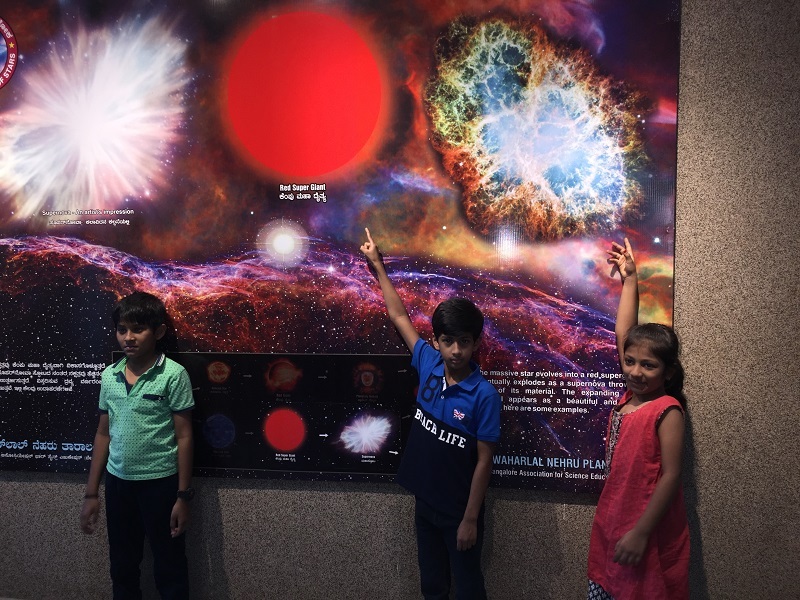 Here are some pictures and details from our recent visit to the Planetarium. Our most recent trip was in Sept 2018. Little Vijay pointing at the stars ! You should plan to spend at least 1 hour for the show and budget additional time at the park surrounding the Planetarium complex. 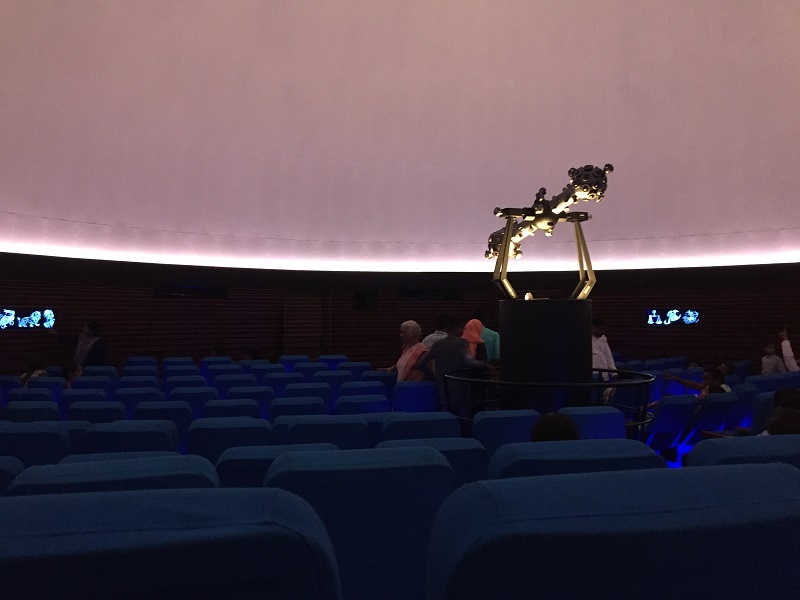 The Jawaharlal Nehru Planetarium in Bengaluru is one of the hidden treasures. It is an ideal place to visit with family, friends and kids. 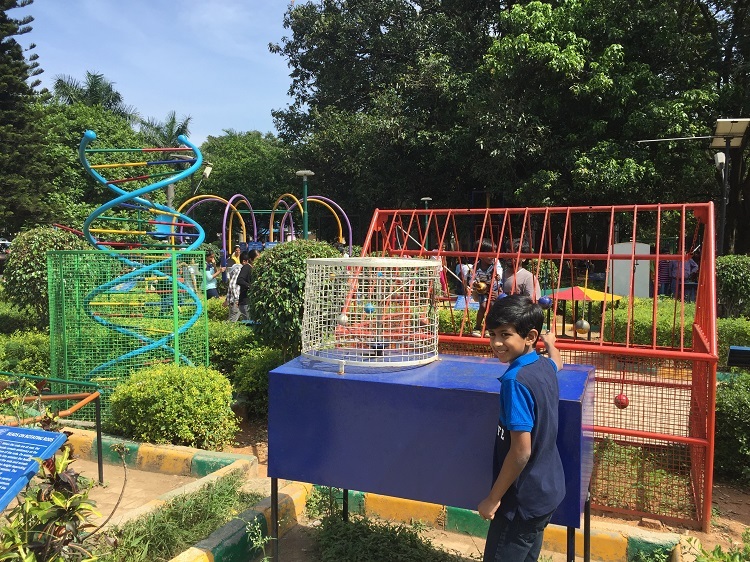 The area around the Planetarium is well maintained and landscaped and the park outside has a great play area and outdoor science 'learning' games for kids. The auditorium indoors is air-conditioned with comfortable seats and the sound-and-light show is well orchestrated. Enterprise Architecture career Q&A : What skills to learn? "How do I change my career from a software developer to an enterprise architect. What skills I should learn?" This is an interesting question though a lot will depend on your interests and background. A “software developer” is a very broad term and can range from a core Java/Web developer to include folks configuring and customizing COTS products like SFDC or Oracle Fusion. There is no indication of the business domain or industry you come from so I will assume you have a basic degree in IS or IT and have a few years of software development experience as a Java or .NET developer. As a software developer you may be aware of some aspects of Information Systems and Technology Architecture, primarily by developing and deploying code to meet business requirements. As an Enterprise Architect, you will have to broaden your horizon to other BDAT dimensions too. Some of it can be done by attending training sessions on EA topics. You should also seek mentoring from EA’s in your organizations or your network. Note: This is a rather short answer to a question that requires a lot more context about your background and long term goals. My response to similar questions on my blog - How important is it for an Enterprise Architect to have business domain knowledge? A while ago, I updated my Linkedin profile to indicate I had relocated and taken on a new opportunity. A few in my network noticed and messaged me. Nothing new here. People switch jobs all the time. However, a few also noticed that I had relocated back to Bangalore, the ‘Silicon Valley of Asia,’ and were curious especially about my experiences in exploring opportunities here. Rather than respond individually, I thought I would blog this piece about my observations. My relocation was prompted by a personal need, to be around to support my aging parents. With the safety net of a job with a multinational, I initially tried commuting between my home in North Carolina and Bengaluru. However, I quickly realized that it wasn’t a practical option and I couldn’t plan to ‘work remotely’ in perpetuity. I began to explore local opportunities in the market, and leveraged this platform, LinkedIn extensively. Most headhunters will tell you, networking and social media are the primary source of leads and opportunities so I began to revive some of my dormant social media contacts, especially people I had worked with in the past. Networking has to be contextual, which means understanding the market to have a focused engagement. The IT Enabled Services (ITES) industry has transformed in the decade since I had been here. According to NASSCOM, the Indian trade association, the IT sector generates revenues of US$160 billion, and employs over 3.1 million people. The ITES also experiences an attrition of over 20 %, which means nearly a million people are switching jobs every year. The trend is similar across the spectrum of the industry – software companies, software services firms and also captive shared services organizations. All this makes for an extremely vibrant marketplace by any account. Most of the tech jobs are concentrated in tech belts in three or four major metros in India, and the ITES industry continues to be bottom-heavy. Although the industry continues to mature, the jobs seem to fall into distinct categories in a pyramid. Hands on roles – These hands-on folks develop code, configure service and test and debug services. Those with 1 to 5 years experience are the most in demand. Recruiters and hiring managers are rather rigid when it comes to this ‘years and roles’ mapping. A person with 10 or 15 years’ experience is not expected to be hands-on. Therefore, a seasoned programmer or developer will find it hard to sell herself with a resume showing 15 years’ hands-on development experience. Each category in the pyramid has a distinct pay-package associated, and there is a perception that over-qualified candidates may not be tenured or stick around, even if they are willing to accept a lower package. Recruiters automatically screen out such profiles as ‘over qualified’ citing cost constraints and tenure risks. After a brief review of the market and vetting my understanding with a few people in my network, I began leveraging LinkedIn in my search. After all, there are anecdotal accounts to indicate that social media, especially LinkedIn is the primary networking tool used by candidates and hiring managers alike. 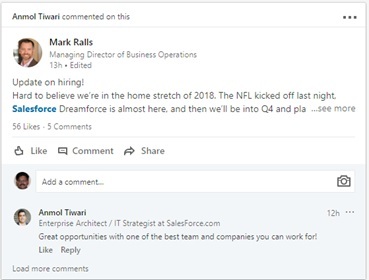 How does LinkedIn connect candidates with opportunities? There are hundreds of thousands of ITES professionals on LinkedIn; some more active than others. Not surprisingly, there are different techniques candidates and hiring managers use while connecting with each other across the market and job segments. Managers posting opportunities directly: During my search, I noticed that scores of hiring managers directly posting opportunities on LinkedIn. The reach of such posts can be amplified beyond one’s network when peers ‘like,’ and ‘share’ such posts. Such direct engagement can connect you instantly with hiring manager posting the request, especially if you have the skills and experience in the topic of interest. Announcing ‘seeking an interesting opportunity' – Many candidates update their LinkedIn headline to indicate that they are actively seeking new opportunities. Recruitment consultants are divided on this approach. On one hand, a person who is active in LinkedIn groups whose profiles indicates they are also available may interest hiring managers or recruiters. On the other hand, recruiters are generally more interested in those who are already employed and less excited about those in between jobs. Be active in the medium – Posting Pulse blogs, engaging with others on LinkedIn groups and answering queries on topics will get your profile noticed. You should select the mode of communication like a Pulse Blog based on your interests. For instance, not everybody has the time or inclination to post lengthy Pulse Blogs. Such engagement should also focus on specific groups like that of Salesforce, RPA, Mainframes or areas. If change in work location or geography is what you want, engage in forums where target employers and recruiters are likely to find you. Intelligent and articulate responses to queries on such forums will help you showcase your command over the topic while helping peers. Search and Apply – LinkedIn is also turning out to be a vibrant job search engine with hundreds of thousands of new jobs posted every day. Recruiters across industry segments and geographies are actively engaged in the job portal. Many also leverage the one-click apply feature that allows candidates to automatically import from their LinkedIn profile to the employer’s Applicant Tracking Systems. For some of us, networking on social media platforms like Linkedin can become second nature. However, navigating a platform that attracts millions of active users like you and me, may sometimes feel a bit overwhelming. Some people may find it hard to get their profiles to stand out. 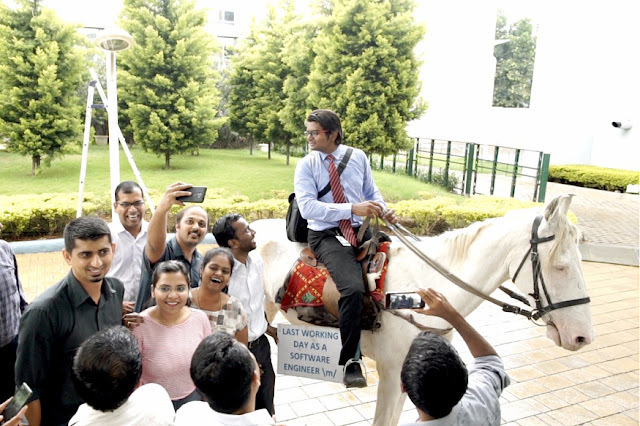 The creative few may find it refreshing to go off the grid: like the Bangalore techie who recently became an internet sensation by riding a horse in busy traffic on his last day at work. Rolling out Robotics, Automation and RPA? Prepare for the initial heavy-lifting! I recently posted a couple of requests on my LinkedIn feed looking for people with expertise in Robotic Process Automation (#RPA link). I got a few good leads and some of my peers reached out asking what I was doing in this space. I figured it was a topic for a Pulse article, building on the theme of Digital Strategy Execution that I had blogged about earlier (link). Automation, especially emerging tools enabled by RPA is getting a lot of attention among technology and business executives. The Use Cases for automation using RPA tools are certainly compelling. Most organizations are likely to encounter gaps in existing processes that evolve over time. Many require users to perform repeated tasks like entering data from printed document or validating data in one system against other systems. RPA tools can help automate mundane, repetitive tasks. Putting together a business case to invest in tools and resources sounds compelling. However, the heavy lifting begins after the business buys into the promise of RPA. As an Enterprise Architect responsible for Corporate Functions, I get involved in technology transformations and reviewing new tools and technologies. The finance business unit was reviewing quick-win automation techniques while planning for a major system re-engineering. The group receives thousands of invoices from vendors and suppliers across the globe. While they had integrated the invoice processing with a few large vendors, the long tail still involves thousands of invoices coming in as faxes and emails with attachments. The business engaged an outsourcer whose team used a semi-manual approach to process the invoices. They take inputs from the mails and reconcile the invoices against the original Purchase Order in the source system, after which the invoices are cleared for processing and payment in another financial system. The process has many variations; for example, some of the invoices are for single items while a large number have multiple line-items. The long-term roadmap involves re-engineering the process to automate the integrations and workflow, which is likely to take more than a year. In the meantime, the team wants to reduce the manual processing that is fraught with errors. This jumps out as a textbook-case for automation using RPA Robots (Bots); after a quick review, the business sponsors signed off on automation. RPA analysts were engaged to review the current steps, and began to work with functional SMEs to plan for automation. And then the wait began; and some began to wonder why. The reason was obvious. This was the first time the business unit was rolling out an RPA solution. Before the initial euphoria died down, we began reviewing the design to enable the foundational elements and infrastructure. IT Governance - Does your IS policy allows system accounts for non-human users? What is the process to enable application specific access for the Bot accounts? A Bot will require a network account, user-id, application and other credentials. The first time you introduce Bot accounts in your landscape, you will have to review the policies that govern accounts used by such non-humans. Business policies – An invoice processed for payment triggered by a Bot will require it to login into the Financial system. The Bot will need credentials similar to a human triggering invoice-processing. Does your corporate compliance policy allow for non-human accounts to login and process transactions on your financial (or HR, or Legal) systems? Do you have the same level of tractability for activities performed by Bot-accounts? Do you plan to onboard and offboard Bot accounts periodically? Basic SDLC – How do you plan to test your Bots? Do you have the systems, environments and test data to validate the Bots? Most business users at enterprises require new systems and processes to be rigorously tested before it goes live. Business stakeholders will expect the same rigor in validating the operations of a Bot before you let them loose in your landscape. Managing Bots – Who is going to operate and monitor the activities of the Bots? Robots can be scheduled to run periodically or triggered by events. However, just like other systems, they will periodically fail or generate exceptions. You will need to extend the support and service model to the operations of Bots. Some of these questions may sound trivial, and may be a non-issue in smaller organizations or startups. However, stakeholders in larger organizations may not articulate such Non Functional Requirements (NFRs) but will nevertheless expect attention to detail when it comes Bots that operate with live financial, customer, employee or other corporate data. Bottomline: Before the first time you decide to roll-out production grade RPA solutions that begin to process your enterprise’s live financial, accounting or procurement data, you need to analyze and agree on the foundation elements of automation. Thanks for reading! Please click on Like, or Share, Tweet and Comment below to continue this conversation or share your experiences with AI, Automation and Bots. The digital divide: the wealth at the bottom of the pyramid ? My tech-economy experience was far less lucrative. In total, I drove about 40 miles (not counting the 26 miles I had to drive between the warehouse and my apartment). I was paid $70, but had $20 in expenses, based on the IRS mileage standards. Semuels’ observations are significant since nearly $1 out of every $2 spent online in the US is going to Amazon (link). The e-commerce delivery-boys (yes, it is mostly guys who are into delivery) earn a minimum wage – about $200 to $300 per month, while accounting for other expenses. The e-commerce delivery-boys in India and China who are delivering packages to their tech-savvy brethren higher in the digital pyramid are bound to be echoing a similar sentiment. Bottomline: The digital economy has defined invisible lines separating those at the top and bottom of the pyramid. However, such delivery jobs in developing economies like China and India are an opportunity for young, semi-educated youngsters to earn a living. Without such opportunities, scores of them might end up unemployed or remain under-employed. Thanks for reading! 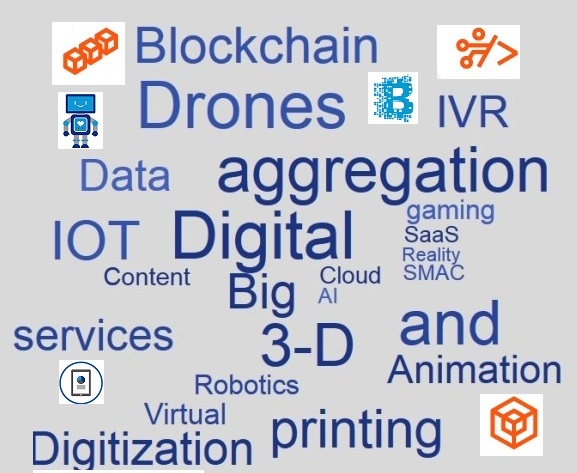 Please click on Like, or Share, Tweet and Comment below to continue this conversation or share your favorite 'trend to watch' | Reposted from linkedIn Pulse blog | Also a link to an earlier blog on the topic: Digitization: Solutions to physical-world problems?! I neither am an extremely staunch follower of Vedic traditions nor am I an agnostic or an atheist. Perhaps the closest term I can use to define myself is a ‘karma yogi.’ My parents, on the other hand, are more traditional, believing a bit on scriptures and the need to follow some aspects of the tradition. At the time of my dad’s passing, I realized that I was expected to plan for the funeral and after-death ceremonies in accordance with the (implicit) wishes of the departed. The reason I say implicit is because I had been unable to have a candid conversation on ‘planning’ for my father’s passing although it was imminent for a while. My situation is not unusual since most Indian families and caregivers are probably going to be in the same boat. They are expected to plan for ceremonies immediately after death, at very sensitive time when families and loved ones are emotionally vulnerable. The decisions and ceremonies are as much as for those surviving, as they are to remember and eulogize the departed. Haggling or ‘negotiating’ over the elaborate nature of ceremonies with rest of the family and the priests can be a delicate matter. One wrong remark can lead to a barrage of emotional responses from others and one risks sounding callous or insensitive. The reason for this post is two fold – to share my experiences with those interested, also give some tips that will be useful if needed. The funeral rituals and ceremonies performed after death of a relative vary across cultures and religions across the globe. Even for a religious sect – like South Indian Brahmin community that I belong to – the ceremonies and details vary widely. A few days after week dad’s funeral in May 2018, I began reviewing process of ceremonies that Hindu Brahmins engage in. These ceremonies consist of a detailed series starting from the 3rd day or the 9th day. If started from the 9th day as I did, it combines the ones from the previous days. I talked to our family priest – who was also my dad’s confidant, Ganapadigal in Malleshwaram, Bengalure - about the ‘process.’ We also touched on the costs. He explained a few details of the rituals that “must” follow be followed. He explained that Brahmin priests like him had made the process convenient for working professional like me; and most of the arrangements would be made at the Vedic Dharma Samaj in Malleshwaram. Vedika Dharma Samaj is located at 16th Cross in Malleshwaram (next to Chowdiah Hall main entrance). The venue is a dedicated location for religious and cultural needs of the Hindu community; primarily for such after-death and other annual ceremonies. The priest briefly explained the nature of the ceremonies that my wife and I would participate until the 13th day. 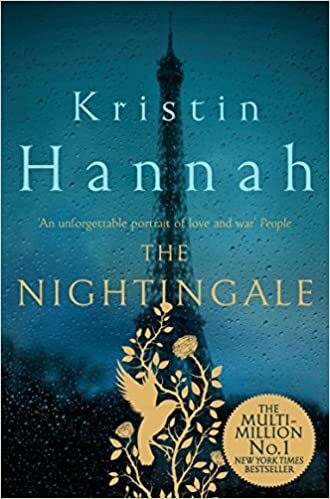 He also explained a bit about the series of ceremonies that would follow, and the days on which I would have to get lunch catered for our family and visitors etc. Note to self: many of these ceremonies and catering of food from outside is perhaps designed to give some respite to the women and others at home who traditionally fret over culinary arrangements. The priest said that the costs range from 75 thousand to 1.75 lakhs Rupees (about US$1,000 to $2,300 at current exchange rate) . He explained that if the budget were at the lower end, it would only cover cost of the room rentals and the bare essentials. The higher slab rates were to provide for additional dakshina (charity) for the Brahmins. I thought about it and called him back and confirmed that I’d prefer to spend around 1 lakhs, and requested him to proceed with the arrangements. In case you are wondering, in 2018, it costs about 7-8,000 rupees for catering a traditional multi-course Brahmin feast for a dozen people. Our priest Keerti, deputed by the ganapadi (head-priest), came in a few minutes and the ceremony commenced. The ceremony revolved around rice pindams ‘depicting’ the departed soul. A few stones were placed in the bucket filled with sand. All this was followed by chanting of Sanskrit mantras. At the end of the ceremony, the priest Keerti escorted us downstairs with a bundle of 10 rupee notes and a bag of rice. A row of Brahmins suddenly congregated around us and I was asked to donate ‘two hands’ (a tumbler full ) of rice and a couple of raw bananas along with a 10 rupee note. After that we packed up with the balls of cooked-rice (pindam) and drove by a nearby pond (Sankey Tank) where we dropped the pindams to dissolve in a tank of water nearby that is meant for such offerings. The ceremony in many parts took about 2 hours (starting at about 9.30 to 11.15) after which the invited guests came home for a ‘feast’ arranged by a caterer. The multi-course feast had been catered in and the caterers had been instructed on a menu suggested by my aunt and others. Only I was required for the 11th day ceremony that began at 9.40AM with a homam. About 7 Brahmins including Keerti were lined up around the room before Ganapadigal arrived. The ceremony consisted of Homam, generating a lot of smoke and fire – a couple of logs of Neem tree and a lot of coconut husks were placed at the center. A bit of camphor was lit using the long spatula and dropped in the center of the logs that lit the dry husks first. I had to endure the fumes and smoke while the chanting of mantras continued. The seven Brahmins in attendance were given a dakhina (donation) of about 650 rupees each. At the end of the homam, 1 brahmin had to be fed a meal. The Vedika samaj folks had arranged the multi-course meal, and after the homam, the Brahmin sat to eat while I watched and ritually ‘served’ him. I was asked to chant a few mantras while he began to eat. The food consisted of a few varieties of cooked vegetables, paisam, with rice and ghee. After he finished, the Brahmin came back to the room with homam, accepted his dakshina and left. Suja, my wife and I reached Vedika samaj around 9.30 and the Ganapadi was already ready with the homa material etc. During the chanting of mantras, I was asked about the names of our ancestors from father’s side – grandfather, great-grandfather and great-great grandfather. This was to ensure that my father joined his lineage in the after-world. After the havan, three Brahmins had been summoned and I was asked to wash their feet and ‘invite’ them for lunch. The lunch, like the previous day’s was a platter of a few curries, kootu and helping of rice. They eat the food with some kesri that Suja had prepared from home. After they finished their lunch, the three brahmins came and were offered dakshina. After the brahmin’s feast, there was more chanting of mantras. In the meantime, the Ganapadi had prepared ‘gift hamper’ with an assortment of gift items symbolizing things the departed would need in after life. About 15-20 brahmins were summoned to the door of the room 5H. They stood by while Ganapadi took out the wide assortment of r items – a brass Bell, a pair of slippers, veshtis, an umbrella, a sloka book, paper fan, stainless steel plates, cups and other utensils. The amount of dakshina ranging from 500 to 10 Rupees was offered along with the gift items to the Brahmins. Most of them went away happy. Towards the end of the of the ceremony, we collected the pindams again for the day and dropped them at Sankey tank on the way home. The havan for this ceremony was arranged at home, not the Vedic Dharma Samaj. The Ganapadi came at about 8.30 am to setup things and we were ready by then. Three more priests joined him. The chanting of mantras continued and I tried to follow along by reciting. Towards the end, I was escorted to the verandah where a kalas of water used for the havan was poured on my head. That mug of cold water had a rather chilling effect on me; in more ways than one. I changed over the veshti and came back to sit near the havan. After the ceremony concluded, I offered the dakshina – the 100,000 rupees – that we had agreed on earlier. #1 I have chronicled my personal experiences here and figured it will be useful for those looking for some insights. There may be inaccuracies in my interpretation of terms or the rituals, which you may verify from other sources. Costs are indicative and will vary based on your budget and inclination to perform the rituals. #2. The amount quoted is just based on my experience. I could afford the cost and effort of the rituals so I did; and I recognize that not everyone may be in the same position.